Bright and fun, childish and challenging, A Hat In Time is a treasure of its kind. Many of us have grown up with video games, but most of us aren’t actively thinking about how video games have grown up with us. Gone from the mainstream are 2D side-scrollers, cutesy graphics, simple objectives, and the like. In their place, the market is now flooded with hyperrealistic attempts to create almost an interactive movie full of grit and intensity. There is nothing to say that one style is superior to the other, but a landscape lacking in such classic content is missing out on a crucial niche market that could easily be filled. Luckily for those nostalgic gamers out there, Gears For Breakfast is here to play. Published by everyone’s favorite charity game site, Humble Bundle, A Hat In Time is a perfectly modernized take on the old platformers we all loved in our youths. It’s rare to find a game that hits all the favorite aspects of beloved games of yore without entirely foregoing a modern feel for the sake of just making a new old game, but this adventure lives up to modern standards for a great game while still maintaining all of the classic retro vibes. Bright and fun, childish and challenging, A Hat In Time is a treasure of its kind. The game finds you, the aptly named “Hat Kid,” gliding on through space until you are stopped by a mafia man banging on your windows, demanding you pay the toll. In the process, he breaks your ship, sending you, along with the Time Pieces you need to repair your craft and find your way home, careening down to the world below. Accompanied by the antihero-adjacent Mustache Girl, a newfound friend here to help you fix up your ship and punch baddies, you run through vivid townscapes, collecting yarn and Time Pieces, creating new hats and cleaning up the streets. The mafia members serve as perfect antagonists to the game. Archetypal bad guys, these goofy goons fall just short of diabolical, but give your mission plenty of spice to keep things going. You obtain different powers with each fashion choice you make, much like real life. The gameplay stays nice and unadorned while allowing for an immensely enjoyable experience. The headwear mechanics make for fun and dynamic adventures, as you must strategically choose how to deck out Hat Kid. You obtain different powers with each fashion choice you make, much like real life. Ranging from throwing bombs, to freezing enemies, to even stopping time, the variety of choices here truly set the game apart. Topping this off with the use of an umbrella as your weapon of choice leaves players just a carpetbag away from living out their wildest Mary Poppins dreams. Players have pacing left entirely in their control. You can run through, engaging in as little combat as possible, working only to achieve your goals immediately, or you can take your time to explore the gorgeous and vivid worlds that have been created for you, interacting with NPCs, finding items, and stretching out your time in Mafia Town. Either way, the game ensures that players of all kinds will find an experience they will love. 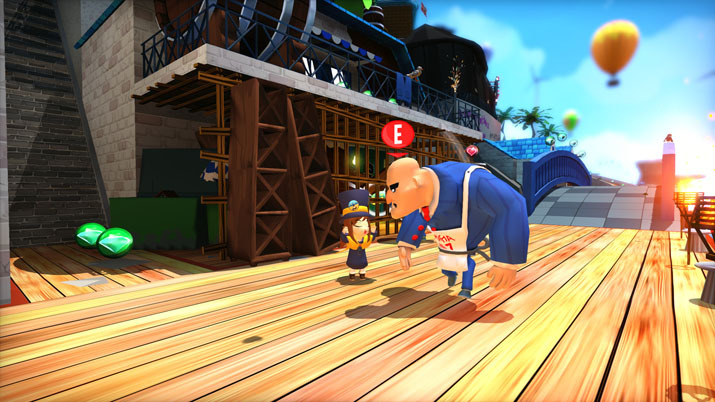 A Hat In Time features brilliantly vivid graphics that bring to mind the Saturday morning cartoons of days past. These dynamic worlds are filled with all sorts of side streets and hidden areas to explore and NPCs and enemies with which to spend your time. Thanks to the simple controls, which still allow for a wide range of gameplay, players are able to very fluidly dash through the streets and over rooftops, churning out sweet stunts galore with ease and excitement. All of the characters you run into are unique and exciting, even if most of them are cookie-cutter clones of the same single mafia man. Animated with goofy and entertaining behaviors and dubbed with silly and fun dialogue, the characters filling the streets are just as perfect as the world they live in. 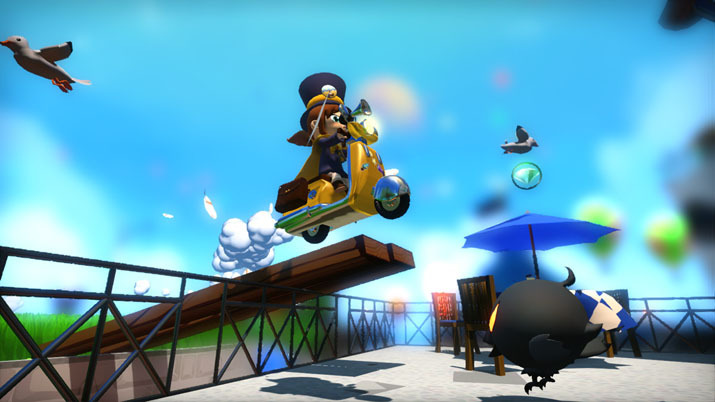 A Hat In Time was made possible by its successful Kickstarter campaign where developers grossed over twice their goal within the first two days. This earned it a title as the highest-earning 3D indie platformer ever funded on the site, and it’s no stretch of the imagination to see why. The story, the play, the graphics, everything it has instills in gamers one of the most comforting and thrilling nostalgic experiences in recent game development history. Instant comparisons of childhood favorites are brought to mind. Sly Cooper, Spyro, all of the games that would make up a beloved childhood collection can be seen in A Hat In Time. Many developers work to make players feel nostalgic with their work, but few avoid relying solely on nostalgia and provide players with such a vivid feeling of childhood glee in their current age. This platformer is itself a perfect modern game, with all of the classic staples players know and love rather than being just an old game made in the present day; in a world of constant evolution and innovation, few things are as comforting as a nice easy blast from the past.